When we last left our intrepid heroine… I’d been dealing with on-again, off-again shoulder pain for weeks. Then Saturday March 15 (11 days ago), I spent 7 hours in excruciating pain until friends were able to get me into Urgent Care, help me acquire all the prescriptions, then head home with instructions for further care. By Sunday March 16 (10 days ago), I was excited at little things like being able to roll over or move my arm. By Monday, I was able to negotiate driving a stick shift so I could feed my Mom’s kitty. By Tuesday, I was able to sleep in a bed at night rather than toss and turn on a recliner chair. I was still using the heating pad every night, plus both the over-the-counter pain killers and the heavy-duty ones, plus the prescription muscle relaxers, just to get some sleep. Unfortunately, Tuesday was approximately when something pinched in my neck or shoulder, leaving my index finger and thumb numb, as well as some of the back of my hand and new aches in my forearm and elbow. By Thursday, there were stretches of hours in the day when I forgot to take any ibuprofen. Saturday, we spent a day at Collegium — all day classroom workshops, learning interesting skills and history. I was Bridget’s assistant in the “How to Learn to Spin on a Drop Spindle” class, which is one of my favorite topics to teach or assist someone else. In the photo below, my raised arm is my injured arm. I’m stunned with happiness that I was able to actually spin in class. I also was able to complete much more weaving (finally! ), the first time I’d attempted that since the urgent care weekend. With frequent breaks, slow and deliberate movements, and very careful posture, my shoulder and arm muscles were able to keep up with the weaving work. True ran two classes at Collegium. His second one, “Your Creative Journey,” actually gave me some very specific ideas about a composition I need to complete by the end of the summer. I’m really pleased with where that will be headed. 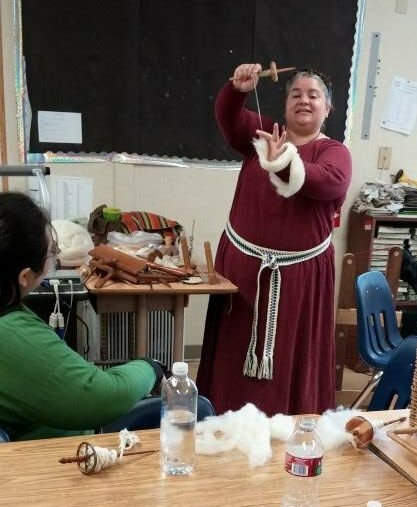 And I was able to attend two different Viking era classes: One by Ciar on costume construction and one by Maeve on Viking era dyestuffs. Both were fantastic courses, and now I have more information to apply to my own costuming needs for the various Scandinavian festivals and faires that True has been attending as a storyteller. I usually go along in an approximate outfit and do weaving and spinning as a side-gig at the festival. Now I have even more historical knowledge to supplement our performances there. We attended a friend’s vigil that evening, but the cold really set into my bones and everything ached — shoulder, elbow, forearm, hand, numb fingers — so we unfortunately had to leave without getting to see the vigilent. It was a lovely, fantastic evening, and I hope she had a marvelous time seeing so many friends. I enjoyed the relaxation with SCA friends, but finally gave in to the need for heat and sleep. 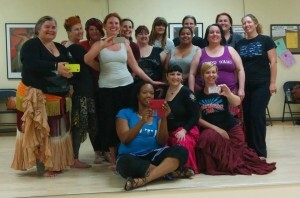 But then on Sunday, I went up to a set of dance workshops, just a little stiff and sore, but not nearly like before. The numbness in my fingers still hadn’t worn off, but I dressed for dance, knowing that I could take it easy and drop out if I needed to. The first two hours were actually the harder set, the class on Spins. The drills near the end of the last hour were tough on my shoulder, so by the last 15 minutes I really wasn’t lifting my arms overhead much. But I sweat and smiled and spun my heart out. It was amazing, after a month of not dancing, to be back in the workout. After our lunch break, we spent two hours on Partner work (Fades and Passes), so we typically danced in sets of two and four dancers. 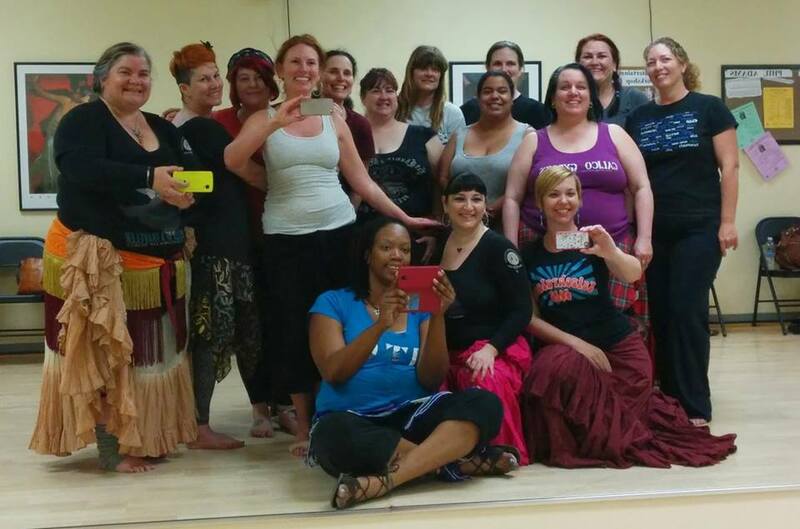 This is where I have the most fun with this form of bellydance: The dance opportunities I have *with* someone else. And I wasn’t exhausted at the end of it. Just happy tired, and exhilarated. The real test: How did I feel on Monday after all the dancing? Pretty darn amazing. I still need ibuprofen most days, and I still need the heavier painkillers and muscle relaxers most nights. Sometimes I take all the medicine *before* climbing into bed, sometimes I forget and wake up in pain and have to get them. And most nights require the heating pad for part of the evening. But even our instructor was on the heating pad the night before class, and our hostess had been dealing with back pain the week before class, so treating dance injuries is not unusual in this community. I had two professional massages during the week as part of my recovery, plus faithfully doing all the pressure point exercises and stretches given to me as homework. I think the oddest thing are the numb fingers. It’s now Wednesday March 26, a week and a half since the urgent care visit and eight days since my fingers first went numb. They’ve never fully recovered yet, but I’m getting used to some of the issues. My index finger is always cold, my elbow aches at night, and everything feels weird like my arm had recently “fallen asleep” and should “wake up” anytime now. But it doesn’t. I’m a tiny bit worried about this development, but I’ll take two slightly numb fingers, back of the hand, and forearm over debilitating shoulder pain, anytime. The rest of my time, when not occupied with commuting to my Mom’s house, caring for her kitty, attending Collegium, attending dance workshops, and recovering from whatever injured my shoulder has been entirely about finding a job. Job Hunting is my Full-Time Job, right now. Today is a three-interview day. I have a phone interview this morning, then I meet with a recruiter around noon, then the recruiter and I head over to my 2nd-interview, 1st-in-person with a tech company in the afternoon. This tech company did a phone interview with me on Friday, and so far they like me enough to want to meet me. Fingers remain crossed! 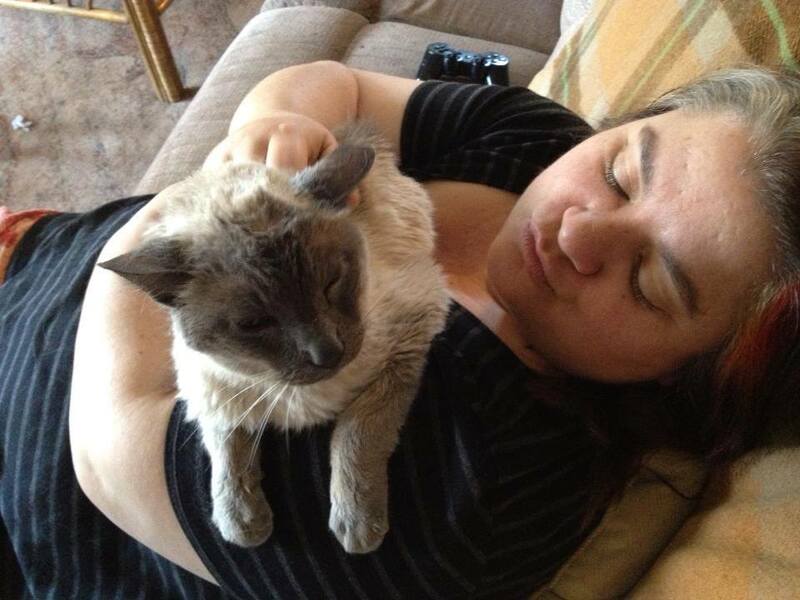 And as a closing sad remark on my week, yesterday we lost a furry member of the family. Simon was a Siamese cat that probably lived to be 16 or 17 years old, and had been with Sweetie and Boyo for over thirteen years. I spent a good portion of yesterday morning scouring my photo archives to find every image I’d ever taken of that wonderful cat. I even found a private home video of Sweetie playing with Simon, bouncing him in the air and singing little silly songs. He’ll never be gone from our hearts, and I’ll miss him for a very, very long time. Have you talked to Santiago (he’s on Facebook)? He helped me when I couldn’t lift my left arm over my head for about 8 months. He really is a wiz with pinched nerves and numb fingers and that sort of thing. I’m glad to hear you’re feeling better! I hope this trend continues. And good luck with your job search. It’s good that you’re getting so many interview requests!